Dirt Fest 2016 in Michigan has added BORN OF OSIRIS and Michigan natives FOR THE FALLEN DREAMS to what festival promoter Matt Dalton calls “the most exciting Dirt Fest lineup to date." Other recent additions include SEA OF TREACHERY, I SET MY FRIENDS ON FIRE, and THE ALPHA COMPLEX (featuring ex-MOTOGRATER vocalist Michael Woodruff). "I’m thrilled to have my friends in BORN OF OSIRIS and FOR THE FALLEN DREAMS join our event. This will be the first time FTFD has played in their home state of Michigan in over two years and their first time back to Dirt Fest since 2006. With Chad (Ruhlig) back fronting the band the timing couldn’t be better" says Dalton. Dirt Fest has a history of giving Michigan bands the spotlight. In 2012 a newly reunited CHIODOS performed their first electrifying show back with original vocalist Craig Owens. Dalton’s Dirt Fest has also helped launch the careers of bands such as BATTLECROSS, WILSON, and SEE YOU NEXT TUESDAY into national recognition. 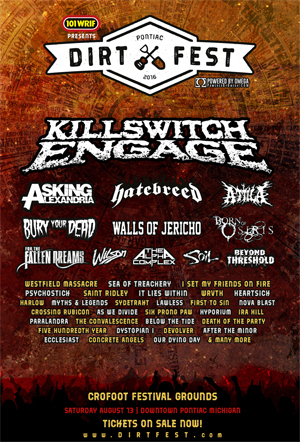 Dirt Fest, now in its 19th year will also host performances from KILLSWITCH ENGAGE, ASKING ALEXANDRIA, HATEBREED, ATTILA, BURY YOUR DEAD, & many more in Downtown Pontiac Michigan on Saturday, August 13. For tickets and more info, visit www.dirtfest.com.